The city has population of about 1.2 million people. 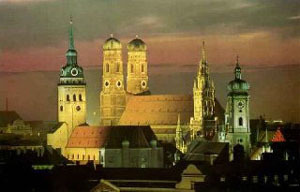 Munich has numerous cultural, artistic, and educational institutions. The Glypothek is a world-famous sculpture museum; the Alte Pinakothek contains an excellent collection of German and Flemish paintings; the National Museum of Bavaria and Neue Pinakothek also house important art collections; and the Deutsches Museum is the largest technological museum in Europe. The National Theater has an excellent reputation. Summer concerts are held in the impressive Nymphenburg palace, near the Amalienburg Pavillion. The oldest part of the city, dating from the 12th to 14th centuries, was built in the form of an irregular semicircle around the original settlement on the left bank of the Isar. Its center is the Marienplatz (Saint Mary's Square), with the former town hall, a Gothic structure dating from 1470s and the nearby Frauenkirche (Church of Our Lady), built between 1468 and 1488 and restored following damage in World War II. The wall surrounding the old city was torn down in the late 18th century, but three of the 14th-century gates were left standing: Karlstor, Sendligertor, and Isartor. 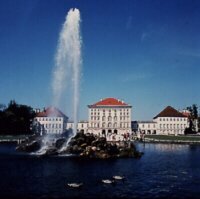 The huge palace (Residenz) of the dukes and kings of Bavaria, built from the 15th to the 19th century, is now a museum. 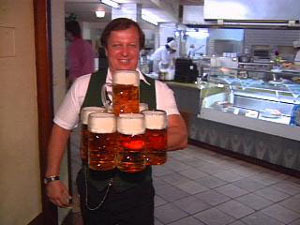 Munich's Oktoberfest, a famous beer festival, is celebrated from September to October.